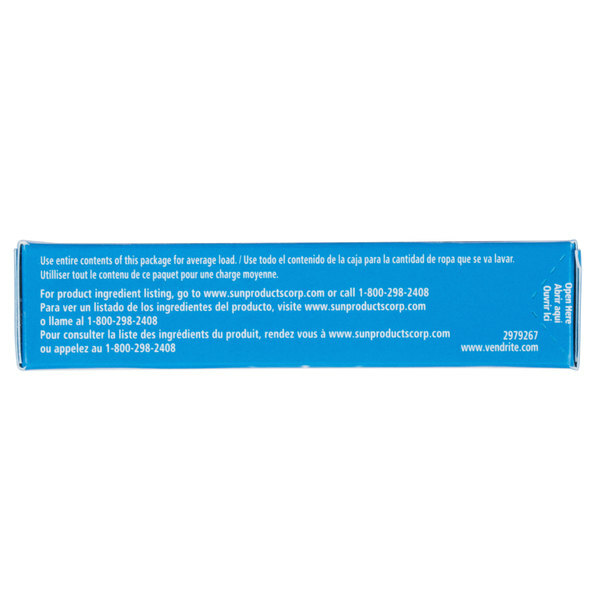 4 1/2" x 2 3/4" x 1"
Keep this 2 oz. 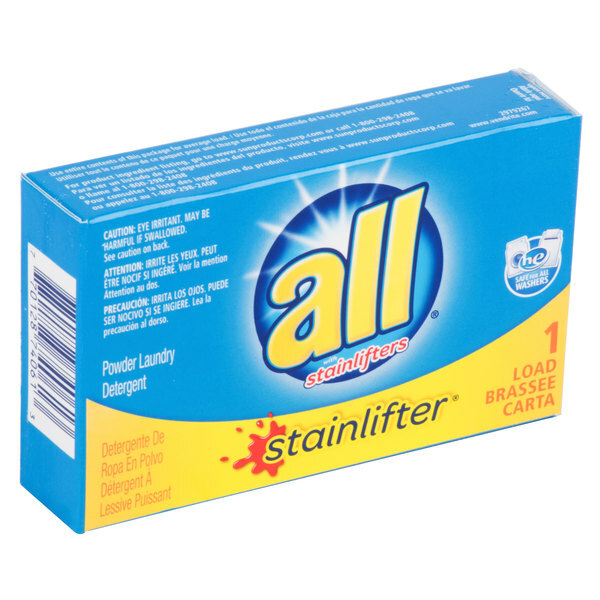 ALL stainlifter powder laundry detergent box for coin vending machines stocked on hand for guests. 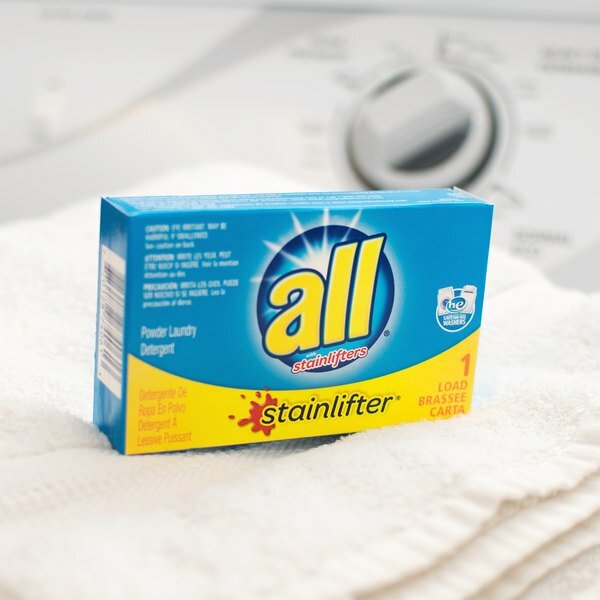 This ALL powder laundry detergent keeps clothes looking their best. Its formula releases a fresh scent into clothing and is great for removing dirt and stains. Plus, each box is small enough to be sold in a vending machine for easy management. 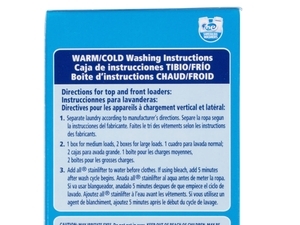 This detergent is ideal for use with high efficiency (HE) laundry machines. "The 2 oz. 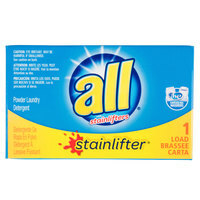 All Stainlifter Powder Laundry Detergent Box for Coin Vending Machine is a great seller. I always have to have an extra box or two onhand because it sells quickly." Designed to fit into a vending machine, this box is designed for a single use application. Its ideal for use in laundromats or college campuses. This powder detergent is perfect for all water temperatures and features powerful stain-lifters to remove stubborn dirt and stains. 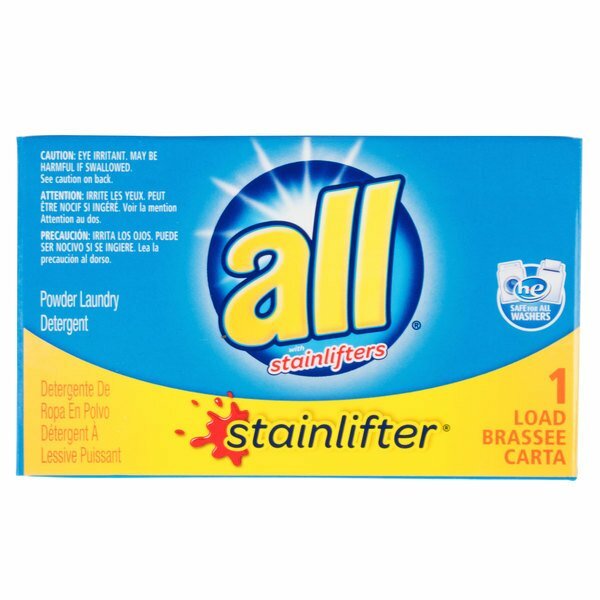 I love ALL detergent! This 2 ozpowder laundry is perfect for when we travel! It is convenient and just ready to use. I would recommend! 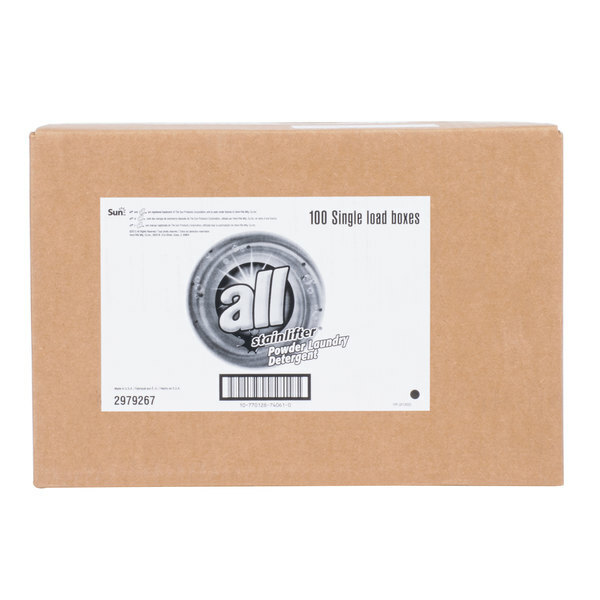 This size and packaging is perfect for travel trailers and vacation homes. You never have to worry about guests using too much in the machine. Great product that my customers really like.I started buying from Webstaurant a couple years ago and the service has been great and saved my business lots of money. Beats store bought washing products. The softest clothes ever/Great ! Price high but results are worth the cost. Will order in the neat future ! The 2 oz. All Stainlifter Powder Laundry Detergent Box for Coin Vending Machine is a great seller. I always have to have an extra box or two onhand because it sells quickly. 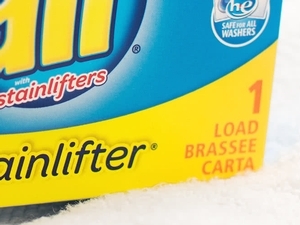 We been using ALL Stainlifter Powder Laundry Detergent long time now . All is good detergent for clothes that you want to smell good after washing . Purchased for our apartment building laundry room, which serves 7 apartments. They fit the 3-column vending machine perfectly and are exactly what our tenants needed! Pricing on this website was the best we found. Perfect size for traveling, smells good. I leave a package in each condominium and the guests are satisfied. Shipping was fast and the product is well packaged. 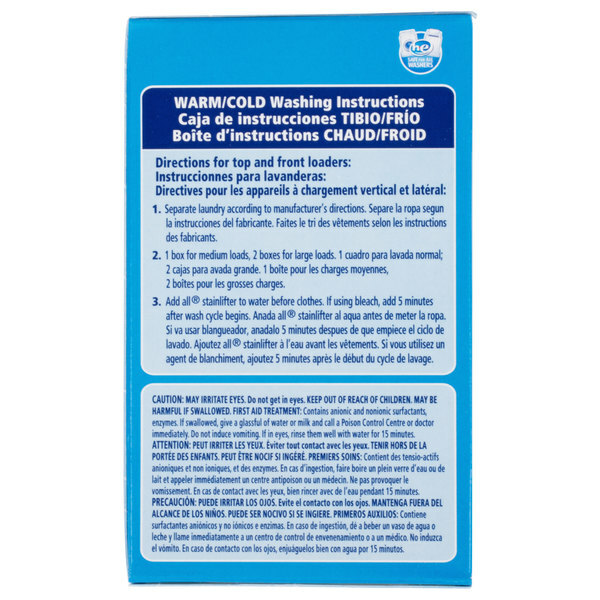 I love the 2 ounce laundry detergent boxes for easy measurements for loading clothes for home and for my son's dorm use. The brand is also very reliable. These were a good value for our coin-op guest laundry. We don't actually use them in a vending machine, but keep them on hand for our vacationing guests who may have forgotten to bring their own. All Free & Clear is my go-to detergent for anyone with allergies, or even for baby clothes (other leading brands for babies don't lift the stains and smells, if you ask me) The value is here, don't buy at a chain supermarket. If you're worried about family/new guests/etc having allergies to regular detergents (which happens! trust me) then don't hesitate to get this. The ALL Ultra 2 oz. 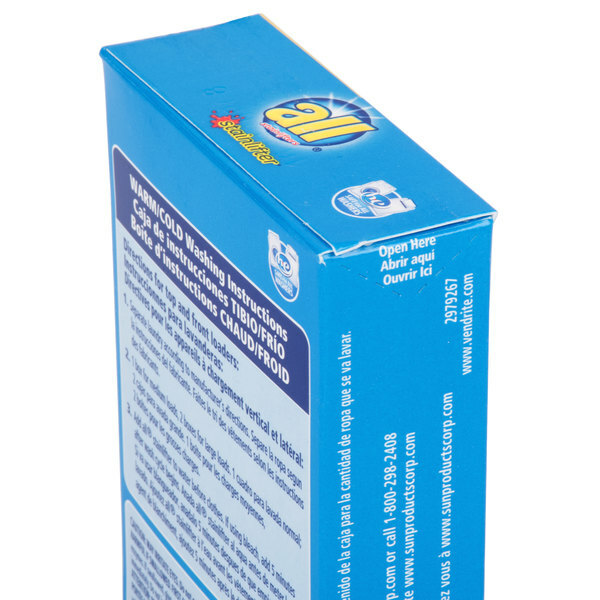 Powder Laundry Detergent Box for Coin Vending Machines sold 100 per case. 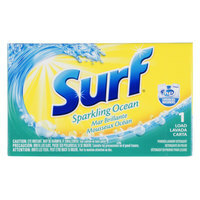 It is great laundry soap even works on the toughfest stains.Great for sending with your kids to collage too. I volonteer at a food bank for poor n sick people in my area. We have had many requests for soap but dividing a large box of soap was not on my want to do list. This worked perfectly to give each person some soap.You made it so easy!! i will be ordering more after first of year as I am over my tax deductions already.